In 1926 when it was first designated U.S. 60, and latter in the year U.S. 66, it was a mere highway, a partially paved road connecting two of the nations largest cities. Today, however, more than three decades after it officially ceased to exist, U.S. 66, reverently known to legions of fans and enthusiasts as the Main Street of America, the Mother Road, and Route 66 has transcended its original purpose. It is an American icon enshrined in the pantheon of larger than life folk heroes and landmarks such as Paul Bunyan, the Alamo, and Jesse James. It is also America’s longest attraction. It is a living time capsule where the entire history of 20th century American societal evolution is preserved. Intertwined with this long and colorful history are links to and vestiges of the 19th, the 18th, and even the centuries before the “discovery” of America in 1492 when modern cities were thriving along the Pecos River. When I launched into uncharted waters more than two decades ago (with the gentle encouragement of my dearest friend) and decided to try my hand at trading stories for money (or food or gas or tires or …)the focus of my published work was the evolution of the American auto industry between 1885 and 1940, and the changes wrought upon the world by this industry. At some point between writing about the prolific blind inventor of cruise control, a Swiss immigrant named Louis Chevrolet and the role avid bicyclists played in the establishment of an American highway system, I began writing on a road that I knew rather well – U.S. 66. In recent years sharing the road, its unique culture, and its colorful history have dominated my work as an author. Now, it seems, a new venue for sharing these tales is unfolding. Public speaking was not something I aspired to. In fact, it was something I avoided, like snow or generic restaurants. Then I was asked to speak on Route 66. Then I was asked to speak about this road in the Netherlands. Then I survived a technical glitch that left me stumbling and fumbling in front of a very large audience. Somewhere along the line, with the provision of historic photos from Joe Sonderman, Mike Ward, and Steve Rider, and photographs that my wife and I gathered on our adventures, a series of presentations entitled an Armchair Tour of Route 66 was conceived. In January, at a fund raising initiative for the Route 66 Association of Kingman, this presentation made its debut. As I am not a polished professional in this sphere there was some concern about its delivery. Well, as it turns out, as is often the case, it wasn’t quite as bad I thought. That presentation led to the request for others; this weekend for a large group at Grand Canyon Caverns, the following weekend at the Holbrook Route 66 Festival (don’t forget to sign up for the one of a kind relics tour). 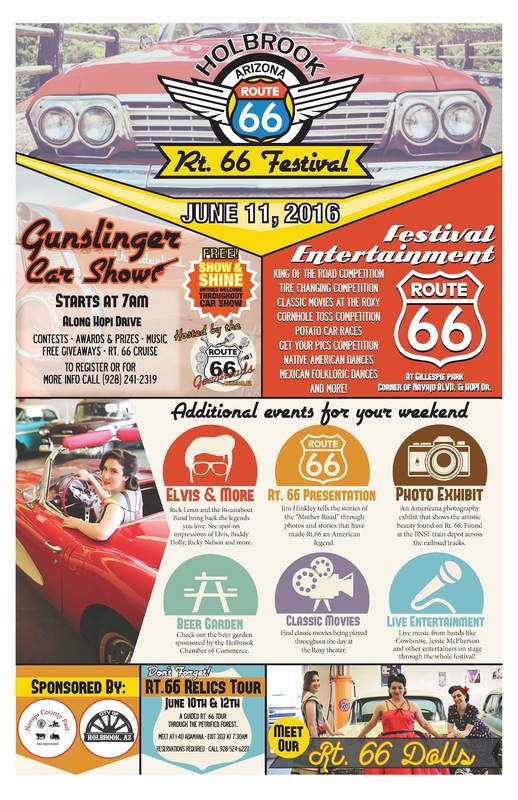 Then there is the first European Route 66 Festival. Also on the list a school in Germany, and Cuba Fest in Cuba, Missouri this fall followed by another at the Missouri History Museum in St. Louis and one at a school in that city. Now there is discussion about making one at the 90th anniversary celebration of Route 66 in Los Angeles. It does appear that my God given gift for telling folks where to go has been given a new outlet. Are you looking for a tall tale telling gum beater for your event, festival, or fund raiser?